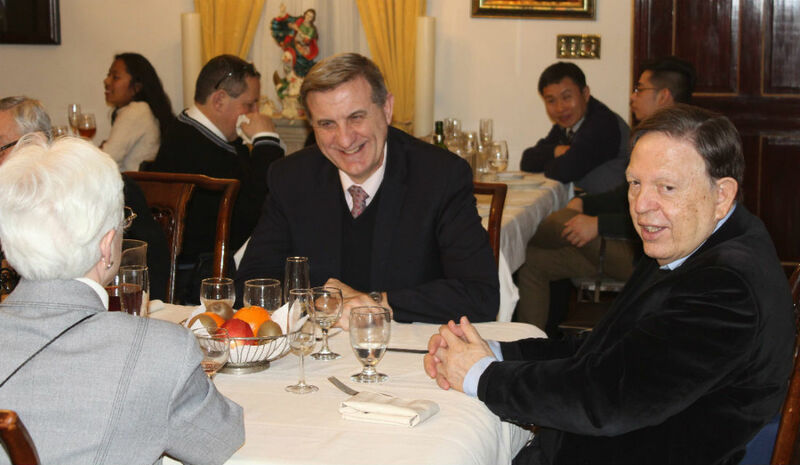 From 1 to 4 February, the communities of idente missionaries, as well as the idente family of Bologna and Busseto, in Italy, had the joy of receiving the apostolic visit of Father Jesus Fernandez, president of the identes missionaries. 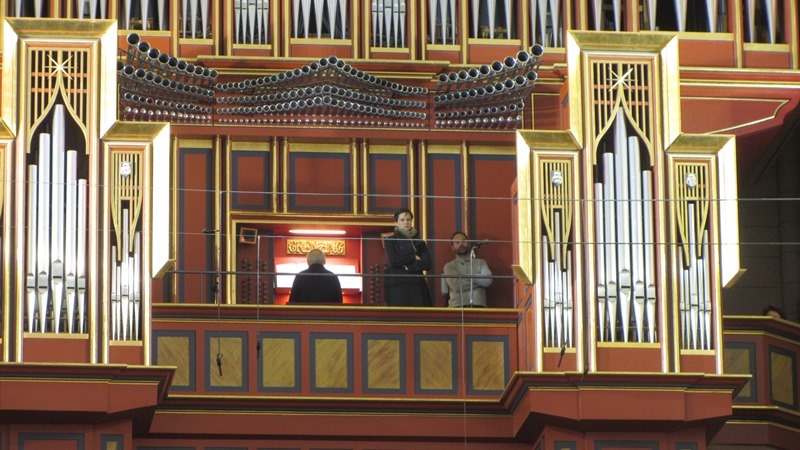 He was accompanied by the Provincial Superior of Rome, Anna Pedretti. 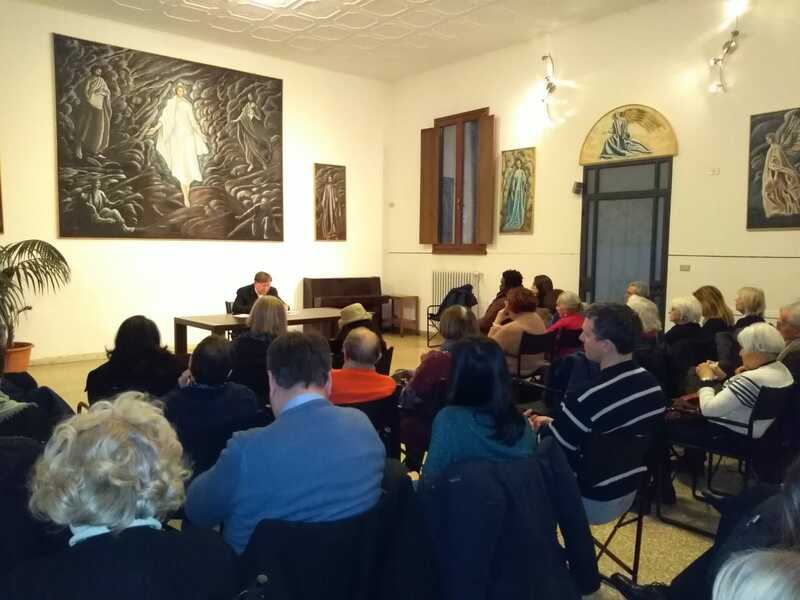 In Bologna, in addition to the meeting with the brothers and sisters, he held a meeting with a group of sixty people from the Idente family, with whom he spoke for about an hour about the Beatitudes and their importance in the lives of the saints and all Christians. 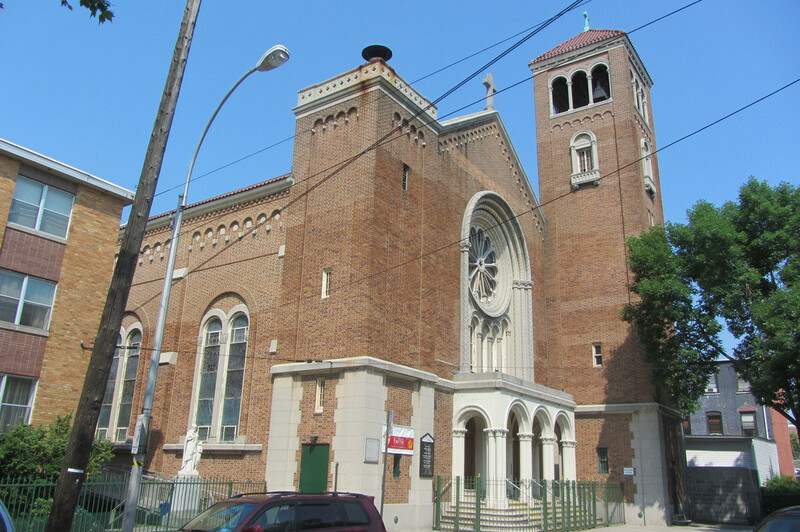 Then, Father Jesus Fernandez moved to Busseto, where the Identes missionaries have been running the monastery of Santa Maria degli Angeli for several years. 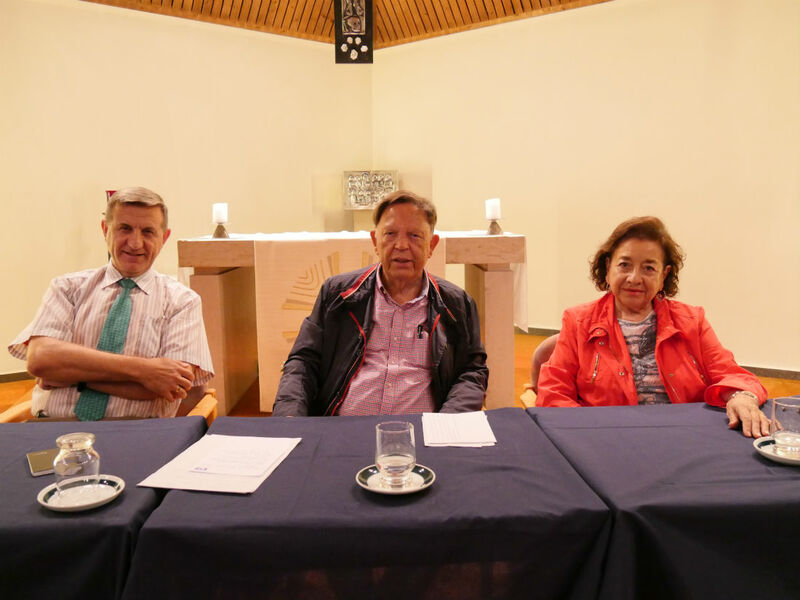 He was also accompanied by the Provincial Superior of Northern Italy, Carmen Timoneda, and by the missionaries Vicente de la Fuente, Maurizio and Letizia Calanchi. In Busseto, Fr. Jesús presided over the Eucharist. 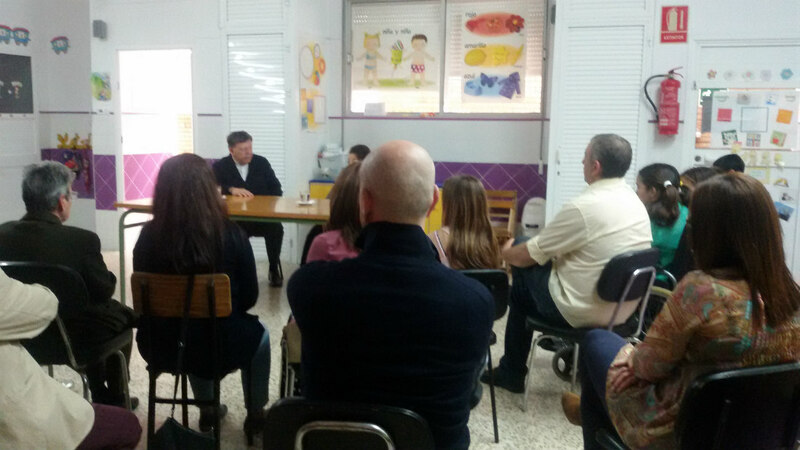 In the afternoon there was a meeting with the Idente Family, in which some women missionaries (Anna and M.Carmen) and man missionaries (Vicente de la Fuente and Daniel Cárdenas) gave a personal testimony of their love for Christ. 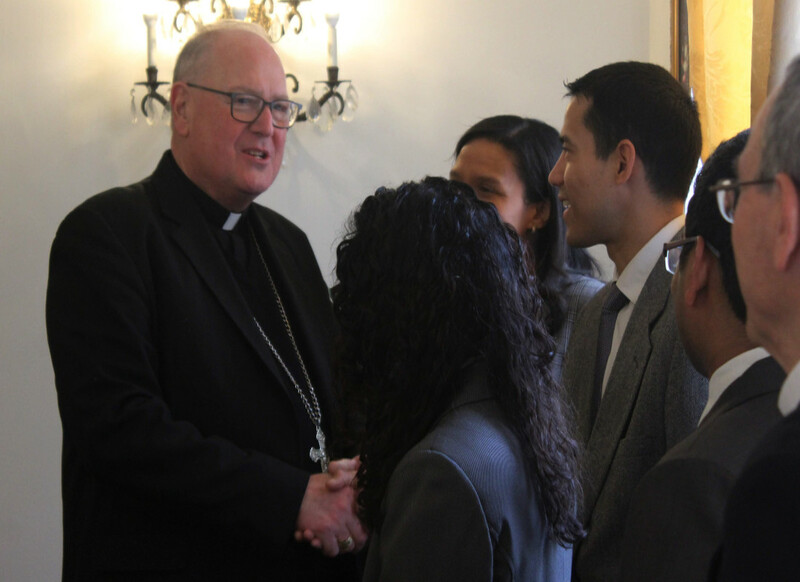 They shared the experience of their vocation in a very moving way that left in those present the desire to commit themselves more to approach Christ. 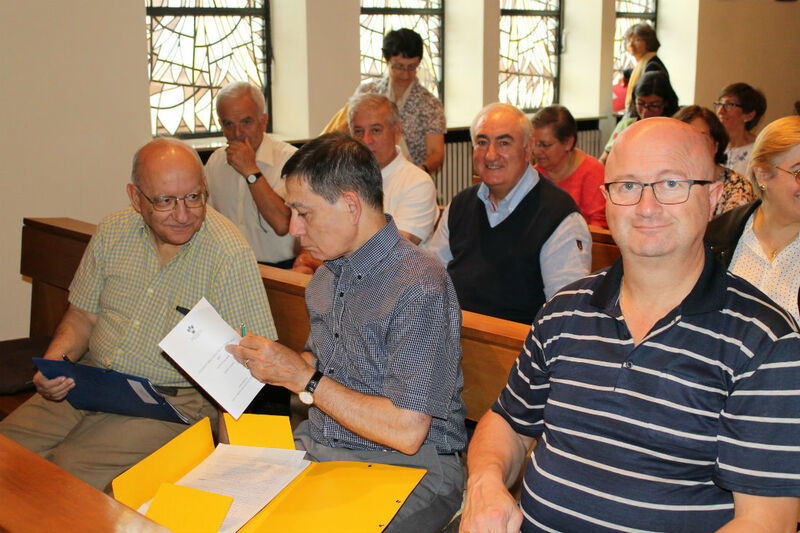 From 19 to 31 August, a formation course for missionaries and missionaries from all over the world, many of them superiors and superiors of the various countries where the diocese is present, is held at the monastery of San Benno in Bad Lauterberg (Germany). Institute. 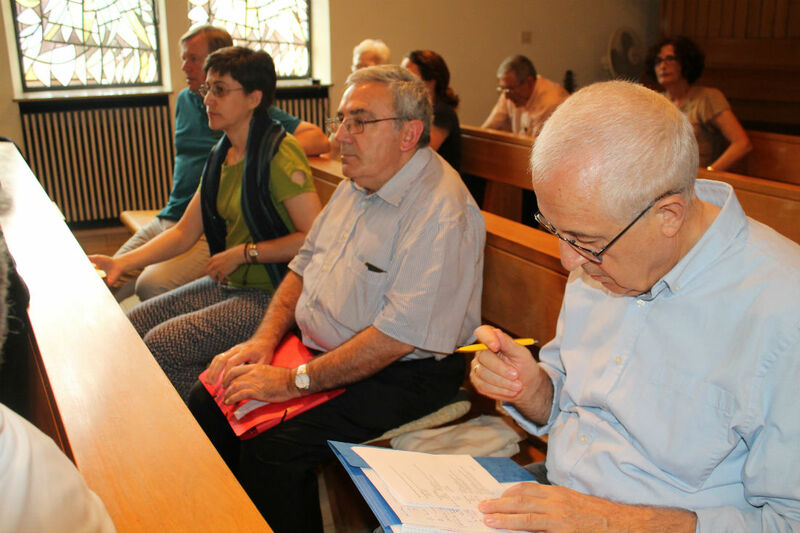 In total, ninety members of the Id Institute have gathered to participate in an intense course that will combine lectures, group reflections, sharing, moments of personal prayer, community prayer and the celebration of the Eucharist. 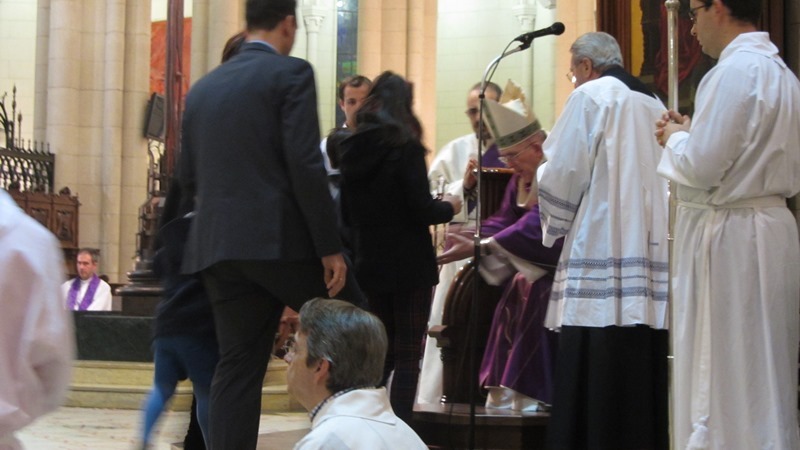 It will be a beautiful moment of renewal and spiritual conversion, as well as growth in the experience of the consecration in the idente charism, inspired by its founder, Fernando Rielo. Fr. 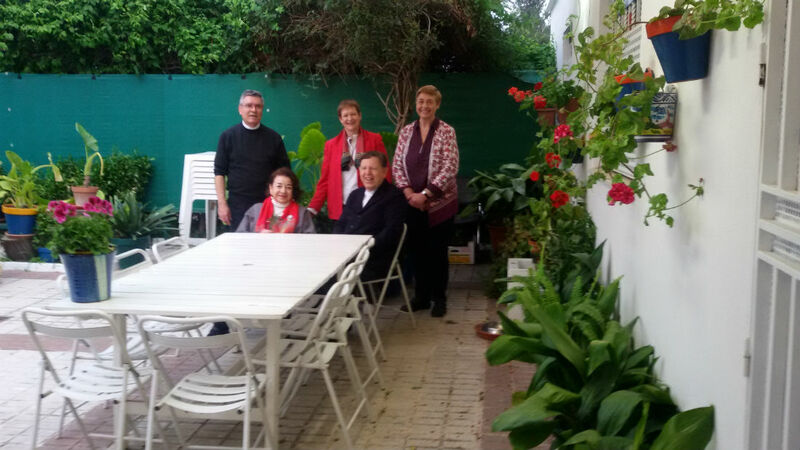 Jesús Fernández, President of the women and men Idente missionaries, and María del Carmen García Viyuela, Superior General of the missionary sisters, visited the foundations of Seville and Constantine from April 15 to 23. 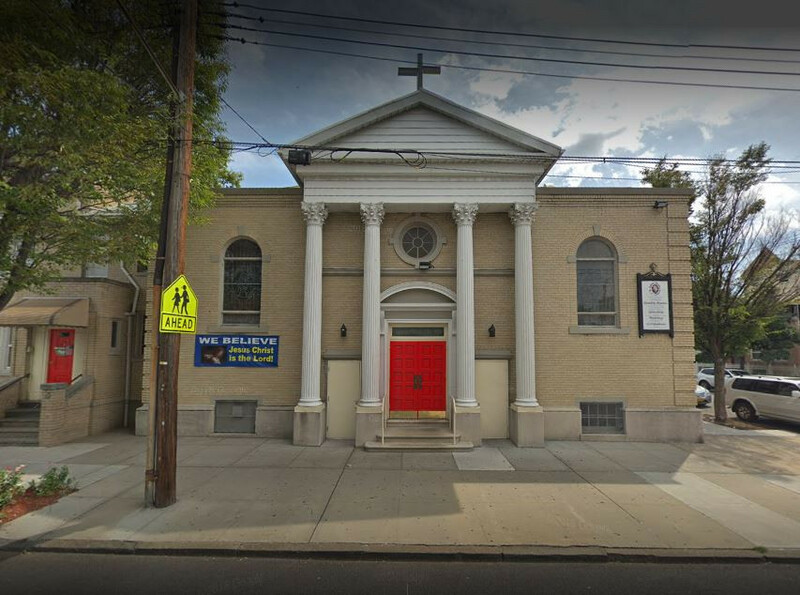 It was an intense week in which they had the opportunity to greet the parishioners of the parish “The Annunciation of Our Lady and St. John XXIII”, entrusted to the idente missionaries; also having a meeting with members of the Idente Catechumenate, Idente Family, Idente Youth and some members of the parish groups; as well as visiting the children of the “Concilio” School, which belongs to the parish. 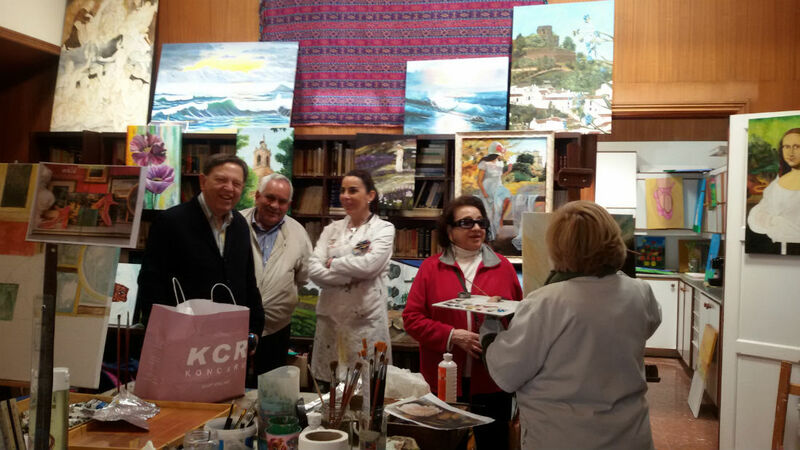 They also dedicated a day to visit the community of missionaries who are in the monastery “La Victoria de San José”, in the mountain town of Constantina, and to share with the students of the painting school “El Gurugú”, which initiated in the monastery the artist and teacher Carmen Meléndez,of Idente Family. The works of this collective in which there are adults and children are reaching great notoriety, not only within the town but outside it as well. The President and the Superior had the opportunity to live together with friends of the missionaries and with young people, whom they got to know better became thanks to their tireless apostolic action, which with their words and the testimony of their lives leaves an impression of peace and joy in those who are by their side. 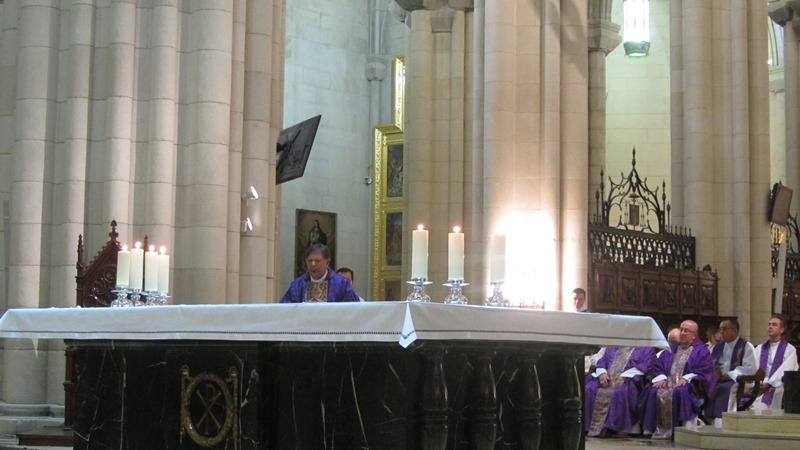 On Sunday 22 the President officiated the Holy Mass in the parish of Seville. In his homily, commenting on the Word that referred to the Good Shepherd, with the strength that characterizes him, he invited everyone to say to Christ “like the disciples of Emmaus: ‘stay with us, I ask you to please, stay.’ Because in the human heart there is too much darkness, too many shadows, too much sadness. Stay with us and if we really ask him, Christ enters into us and directs my thoughts, directs my imagination, my creativity, my feelings … And Christ who is like after the resurrection, and introduces himself to his disciples and tells them ‘Peace be with you’, because Christ is peace; that’s why he says ‘peace be with you’. And what does that mean? That He will help me overcome all my difficulties if I have confidence in Him. If I look at Christ, Christ will dissolve the wounds that I carry in my heart. If I look at the wounds of Christ, what do I see in them? Pure love. But He also looks at our wounds and they are not always for love. There is pain, suffering, revenge, hate. Father Jesús Fernández also explained how to pray the Our Father, adopting the tender attitude of a child with his father. Below the photo gallery of this news there is a video with a fragment of these words of our President. In the different moments shared both with the communities of missionaries and with the rest of the people whom they had the opportunity to greet and know, they did not stop showing their closeness, affection and gratitude, which they have also received from them, because we have all been aware of the blessing that we received being by their side. 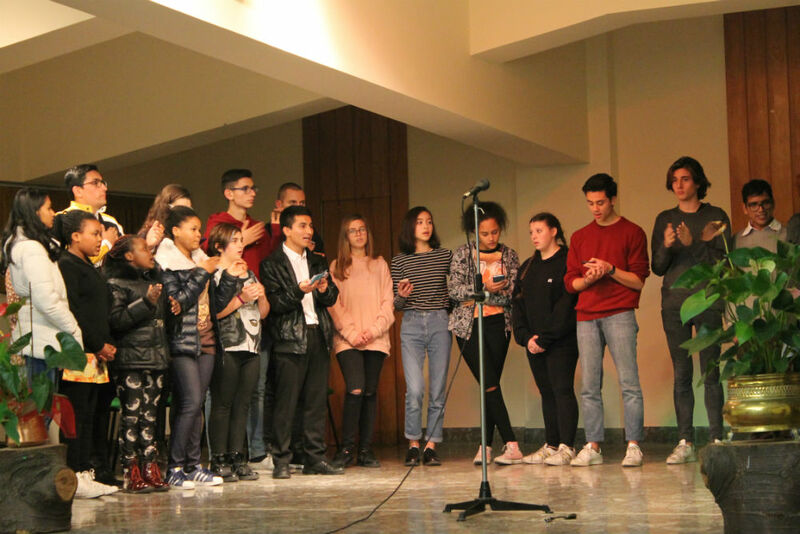 Delegations of idente missionaries, idente family and Idente Youth from all over Italy have met in Rome to celebrate the thirteenth anniversary of the passing into heaven of Fernando Rielo Pardal, Founder of the women and men idente missionary. 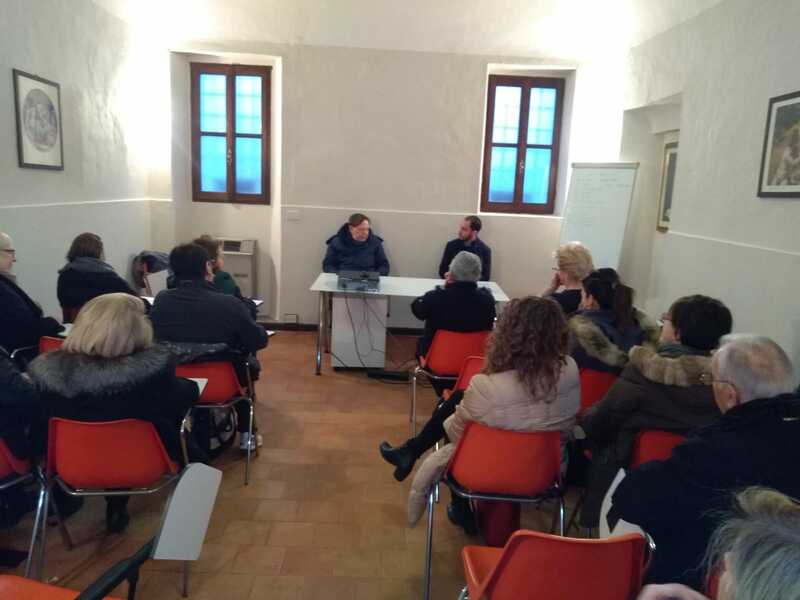 The events began on Friday, December 8, the day on which the national Idente youth meeting and the Motus Christi for young people began, while missionaries and friends of the idente family came to the house per ferie Enrico de Ossò, very close of the Presidency of the Institute. 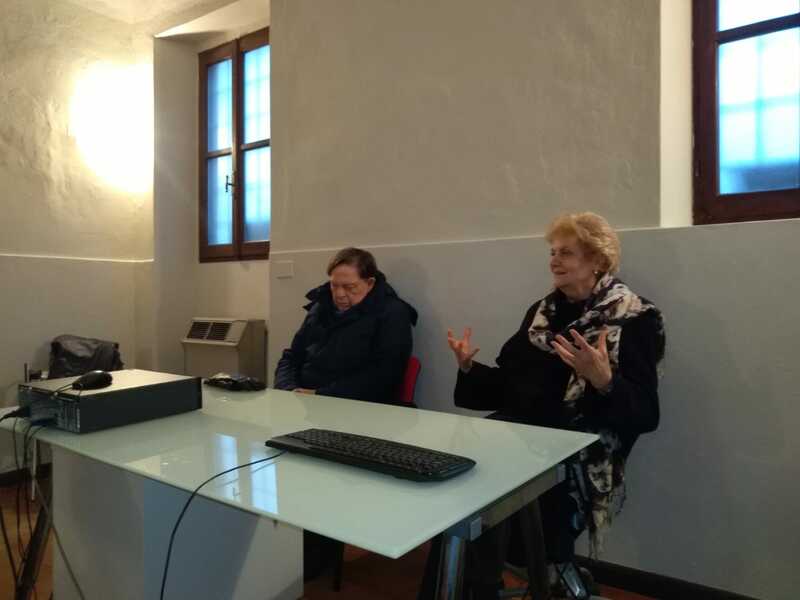 The most intense day was Saturday, December 9, because after breakfast all the groups moved to the Farnese cinema, in the heart of Rome, to attend the screening of the film “Siate santi”, by Catherine Mc Gilvray and Renato Spaventa. It is a documentary about the idente charism, that has the richness of being told by the Founder himself. 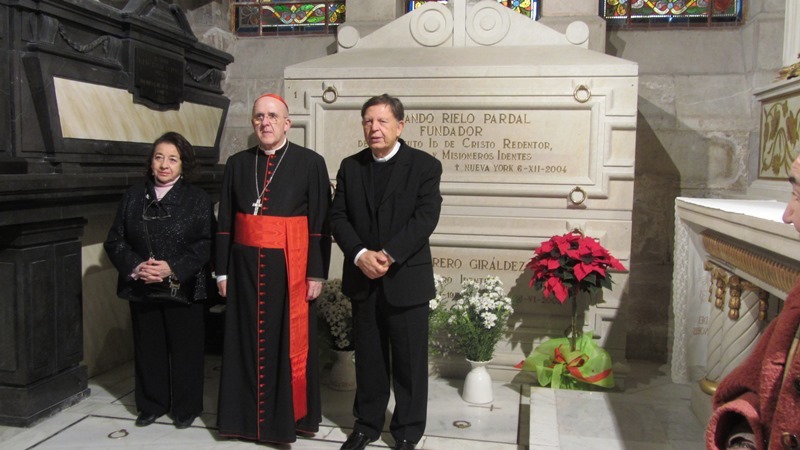 Therefore, it gathers abundant archival images of Fernando Rielo, explaining the nuclear aspects of the charism, which reflects the intensity of his filial experience with the heavenly Father and the passion with which he undertook the mission of Christ to preach the Gospel. 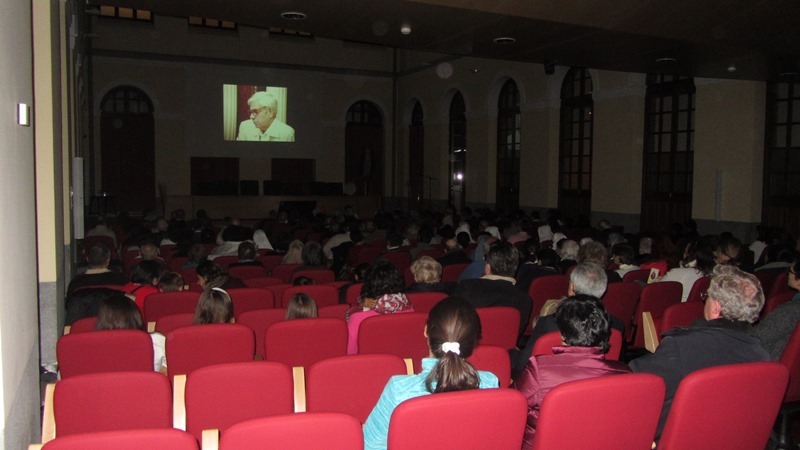 The attending audience lived with emotion this cinematographic session, whose great technical level collaborated with the commotion that in itself produced the prayer and the tears of a founder, that the film gathers with mastery. 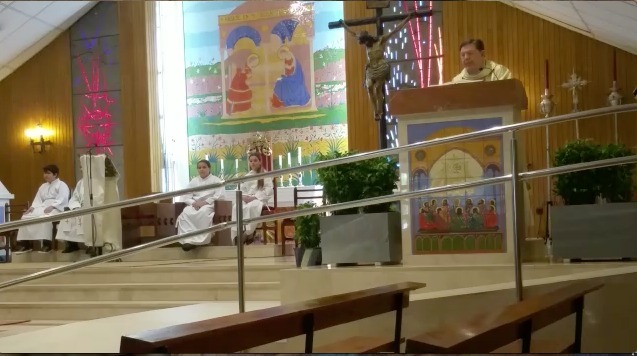 After that, the Eucharist commemorating the passing of Fernando Rielo into heaven, was celebrated in the beautiful Basilica of Sant’Andrea della Valle, presided by His Excellency Angelo De Donatis, Vicar of His Holiness for the Diocese of Rome, and concelebrated by the president of the Institute Id, Fr. Jesús Fernández, by the Superior General of the Theatines, regents of the basilica, as well as by priests from all over Italy. 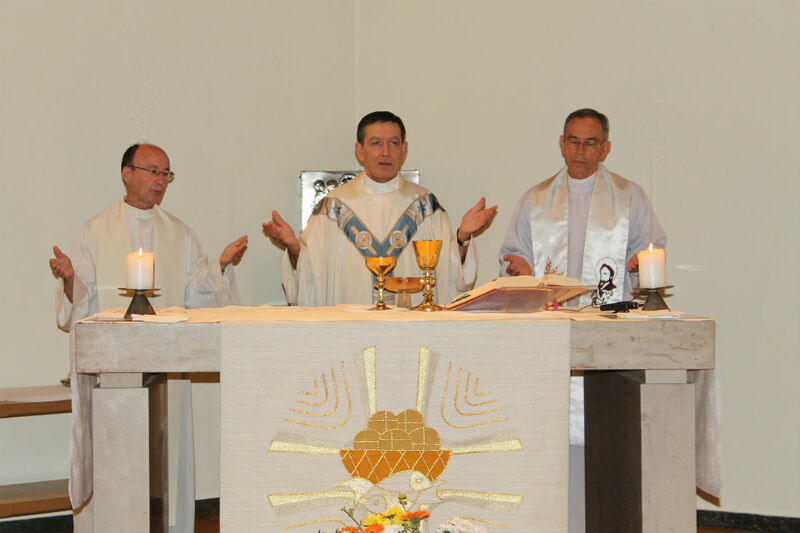 Priests and seminarians of various nationalities, who were friends of the Id Institute gathered there. 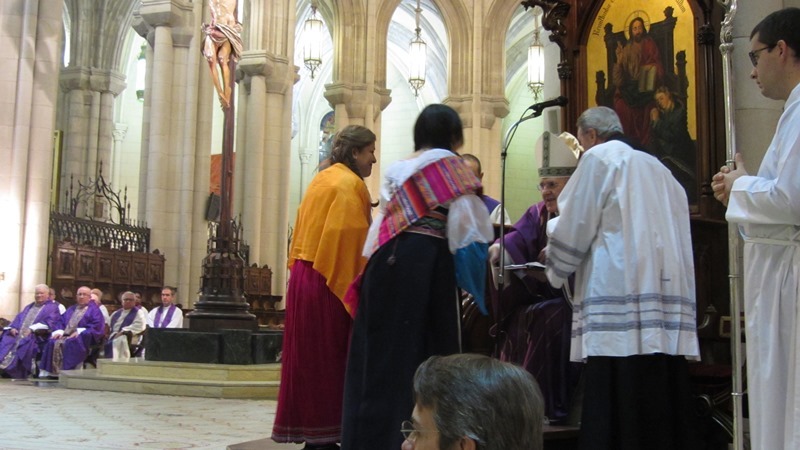 The joy and familiarity of the Vicar marked the celebration, which highlighted the missionary spirit of Fernando Rielo and read with visible emotion two quotes from him: one in which he expresses that the essence of the mission is the intimate relationship of the missionary with the Holy Trinity and the other in which he urges to elevate holiness to the category of mission, unique and essential to the consecrated. 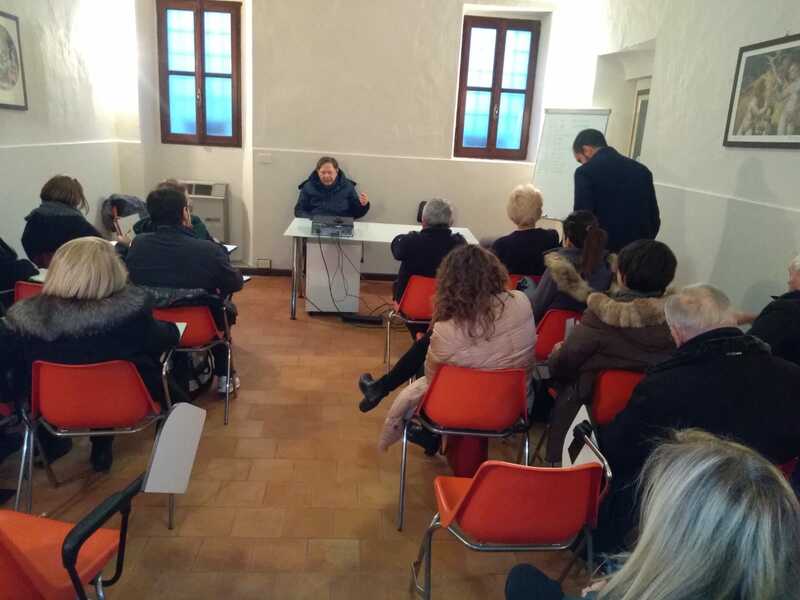 After a lunch in the family atmosphere created from the beginning, there was a claustro or spiritual lesson commemorating the date, given by Fr. 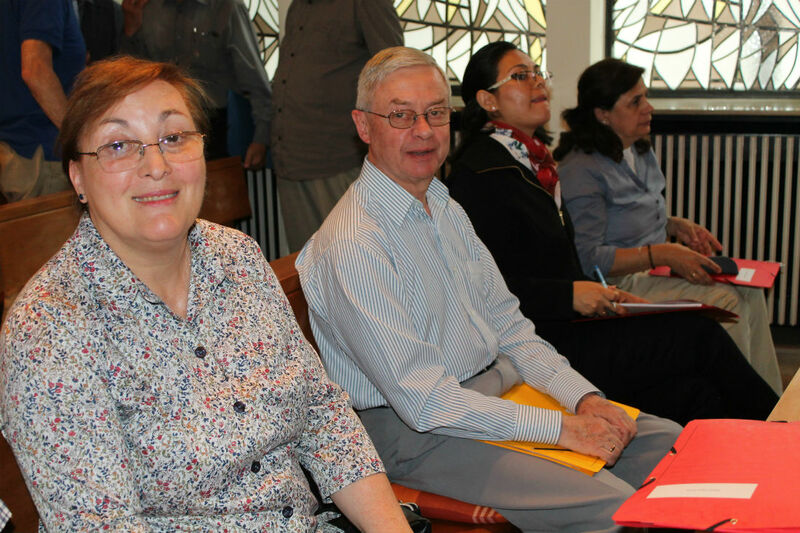 Jesús Fernández, who recalled the keys to living as authentic children of God, especially the openness of the heart to the grace and passionate love of a celestial Father who moves away from all sadness and envelops us in a continuous spiritual joy. 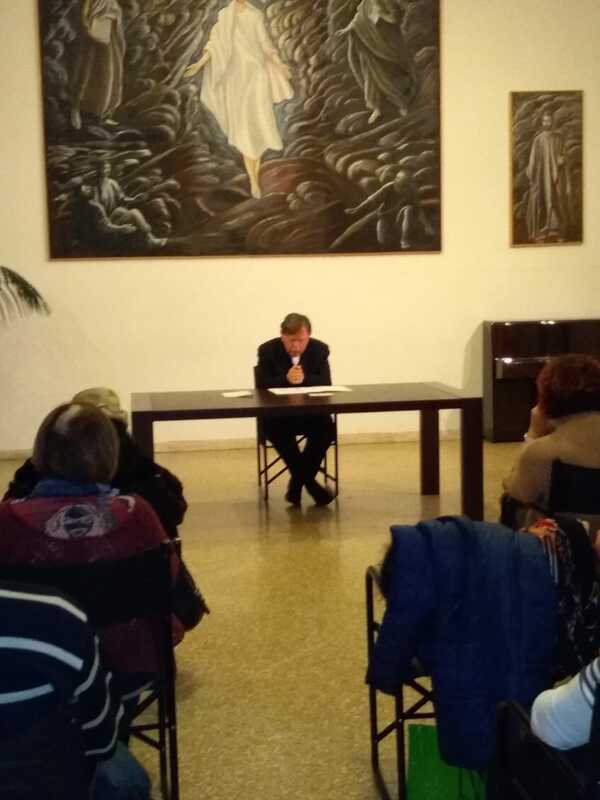 The day ended with an Athenaeum, an artistic evening in which the different groups expressed with generosity and affection their aspiration to holiness and to be authentic in the idente charism. From Saturday night and Sunday morning, the delegations started their return to their cities and provinces. 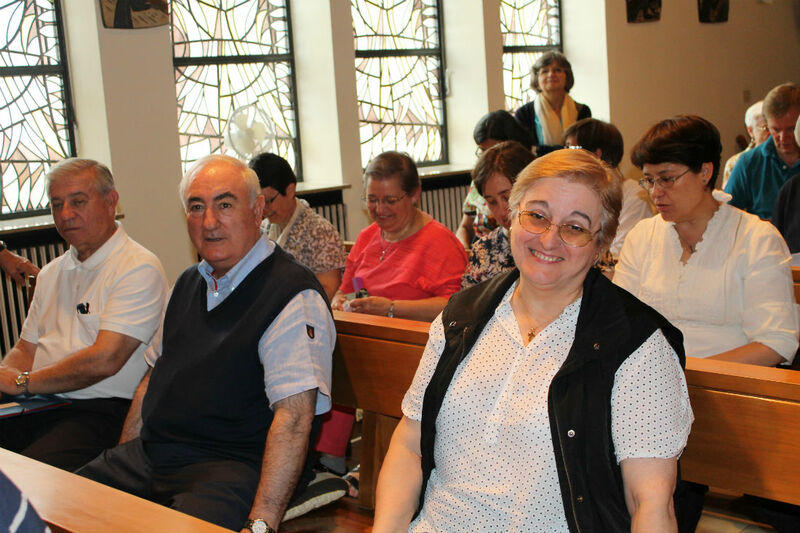 The anointing touch produced by having shared the joy of the idente charism was visible in everyone, as well as the commitment involved in expanding it to so many people from all the Italian foundations. Catherine Mc Gilvray, directora de la película “Siate santi”, introduciendo la proyección. 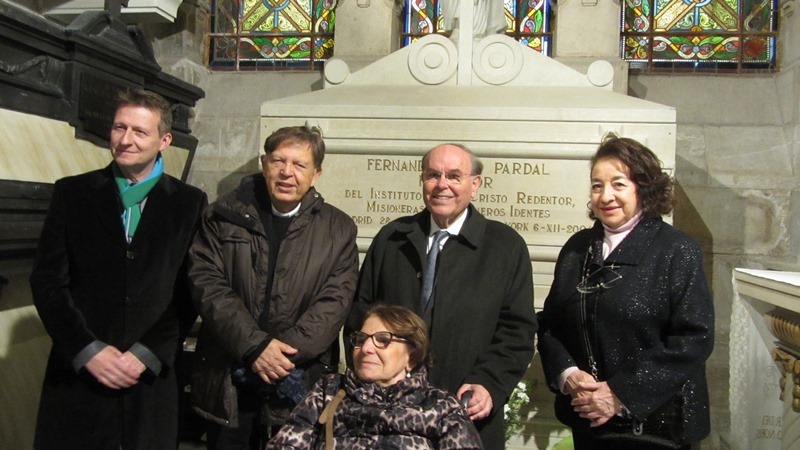 On December 6, the date of the passing to heaven of Fernando Rielo, thirteen years ago in New York, it was an intense day for the idente community of Madrid and Spain, as several events were held to recall the Founder of the Id Institute of Christ the Redeemer, Idente Missionaries. 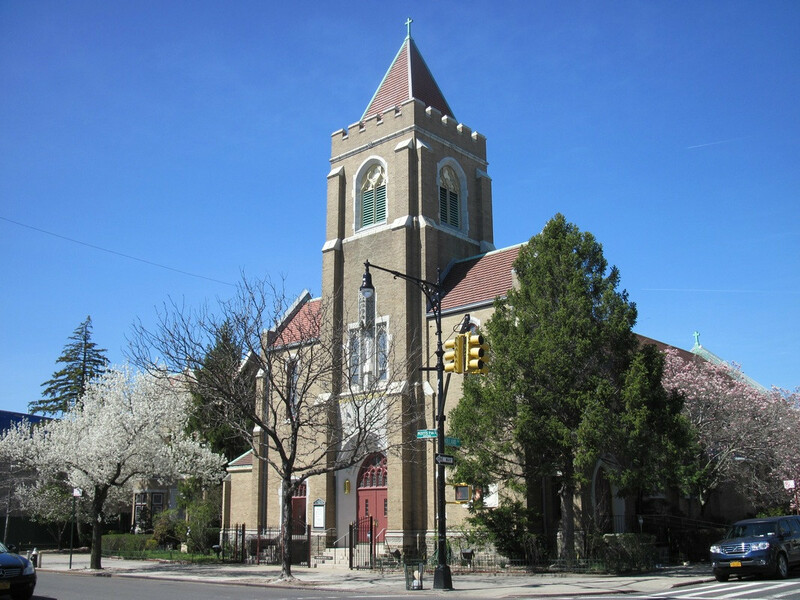 It began at 4:00 pm with the screening of the documentary “Be saints. 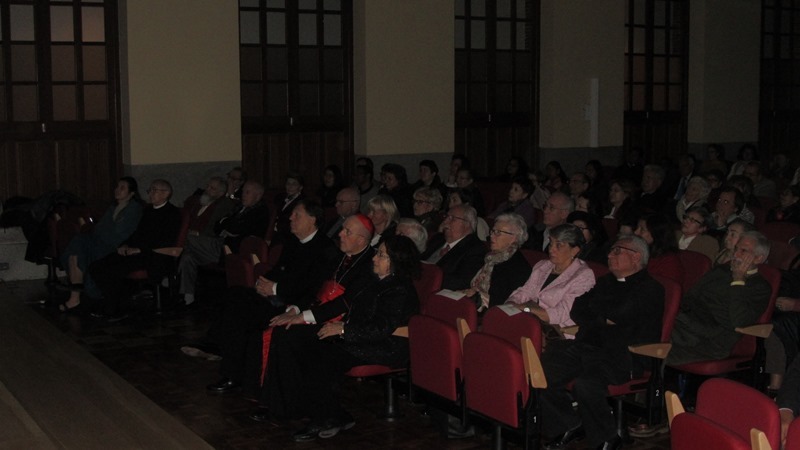 The idente charism ” by Catherine Mc Gilvray, which took place in the Assembly Hall of the Conciliar Seminary of Madrid, with the assistance of the Cardinal Archbishop of Madrid, His Excellency Carlos Osoro Sierra, who would preside over the mass and who wanted to know more closely about the person and work of Fernando Rielo. 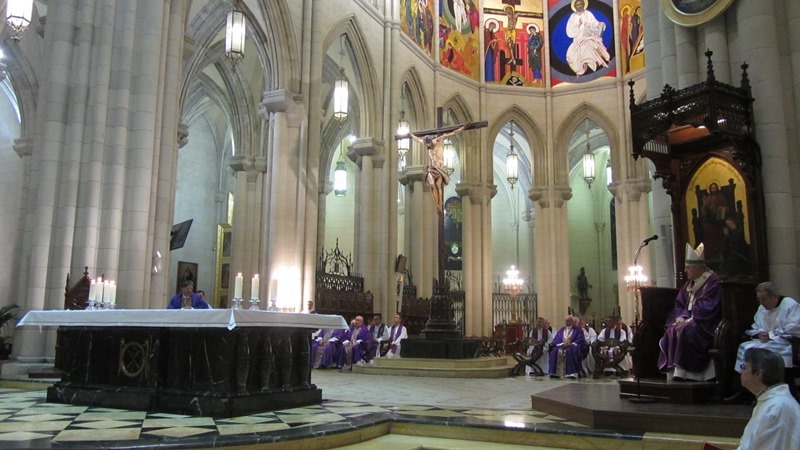 Later, at 6:00 pm, the solemn mass was celebrated in the Cathedral of Santa María la Real de la Almudena, concelebrated by the president of the Id Institute, Fr. 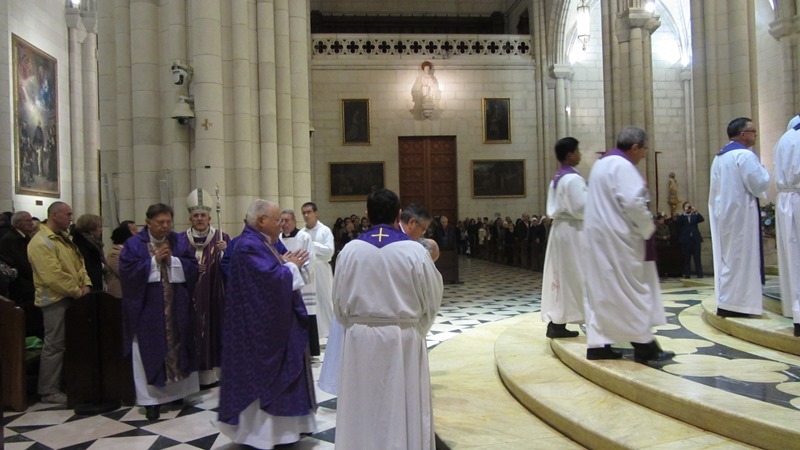 Jesús Fernández Hernández, and by idente priests from all over Spain. 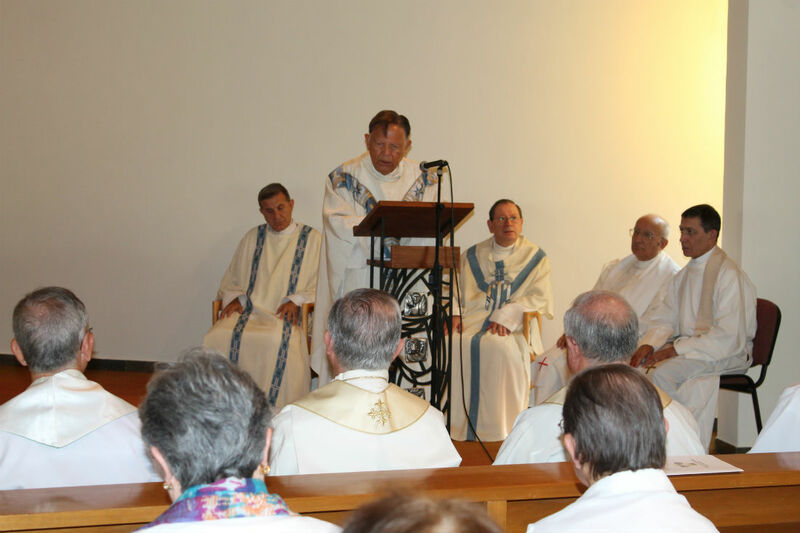 In his beautiful homily, Cardinal Osoro highlighted the intellectual and humanist work of Fernando Rielo, as well as his deep spirituality and said that the religious Institute founded by him is very necessary for today’s society. 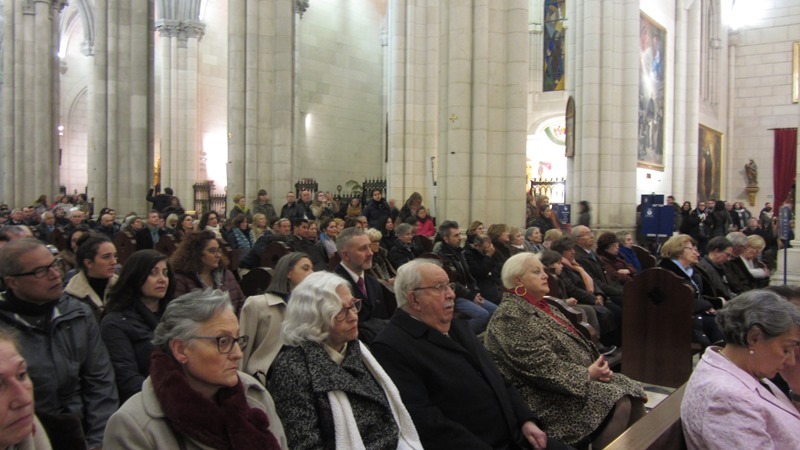 Representatives of the foundations of all Spain gathered at this celebration, as well as delegations of the foundations where Fernando Rielo has left his charism imprinted: Idente Family, Idente Youth, students of the Distance Modality of the Universidad Técnica Particular of Loja (Ecuador), among others. 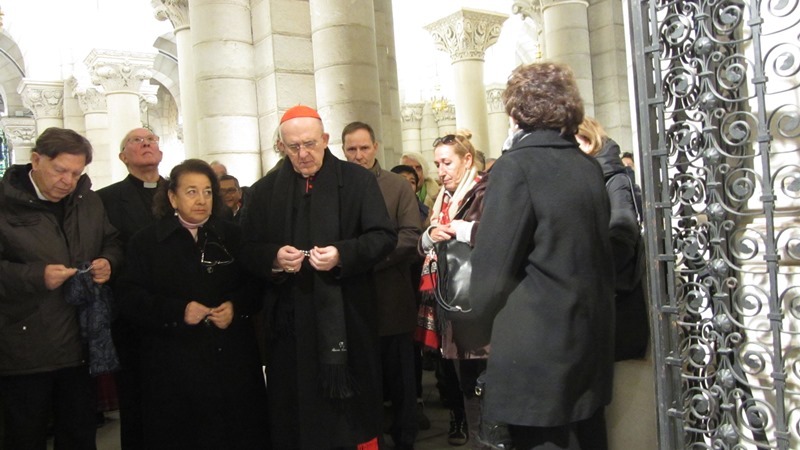 After the Holy Mass, all went to visit the remains of Fernando Rielo, who are in the Neo-Romanesque Crypt of the Cathedral, where they prayed the trisagio idente, an endearing act that was also attended by the Cardinal Archbishop Carlos Osoro. Procesión de entrada de la Eucaristía. 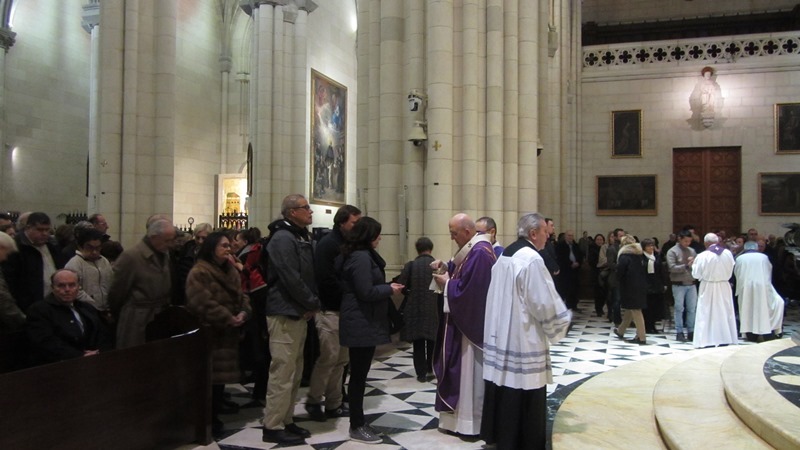 Inicio de la Santa Misa. En primer plano, de izda. a dcha., Juana Sánchez-Gey y María del Carmen García Viyuela, Procuradora y Superiora general, respectivamente, de las misioneras identes. 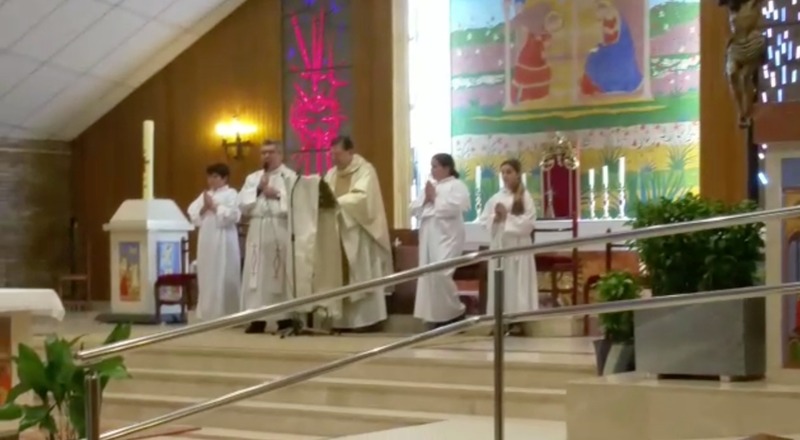 En una de las ofrendas, las personas vestidas con el traje típico ecuatoriano. 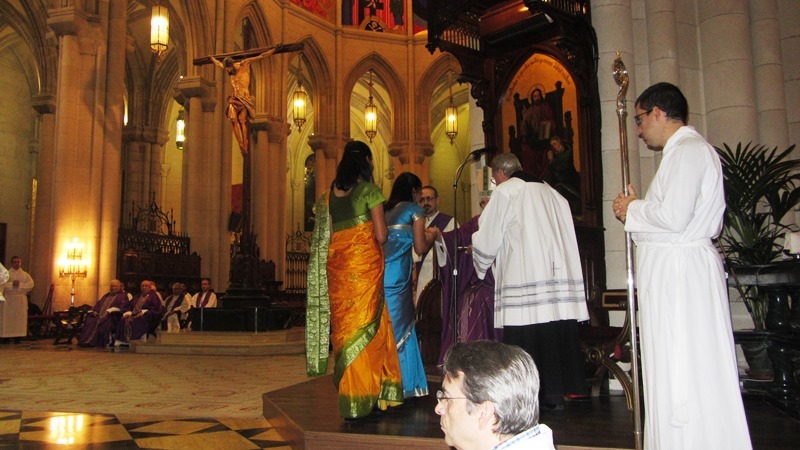 En otra de las ofrendas, vistiendo el traje típico de India. Dos misioneros identes realizando la oración de los fieles. 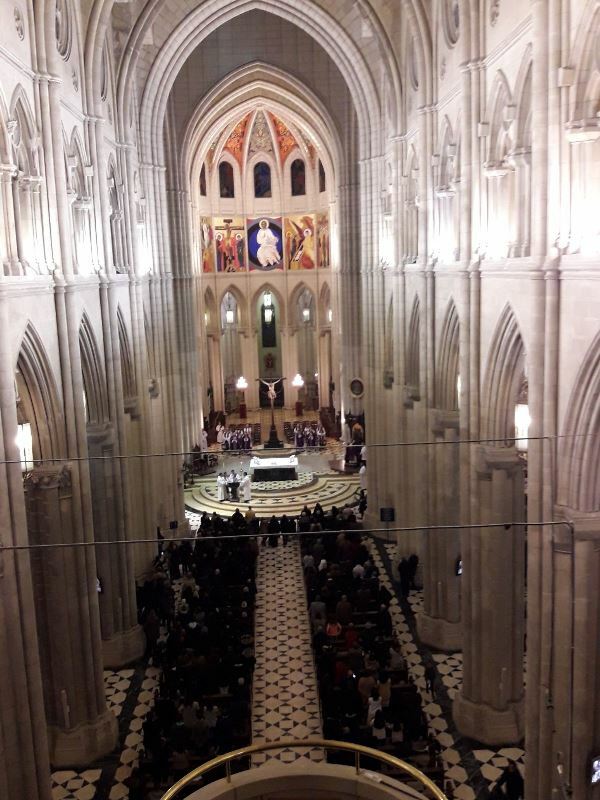 El órgano de la catedral interpretado por Miguel Ángel Tallante, ganador del Premio Fernando Rielo de Música Sacra. El cardenal Osoro impartiendo la comunión. Palabras de agradecimiento del P. Jesús Fernández, presidente del Instituto Id. Vista general del presbiterio durante la intervención del P. Jesús. 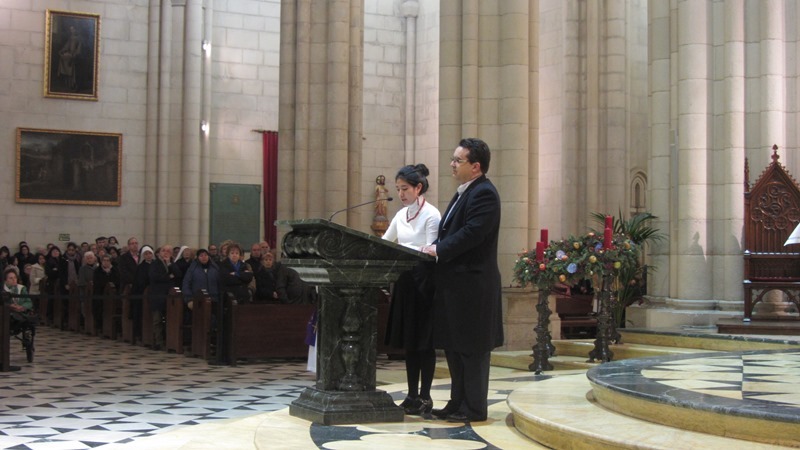 Momento de la recitación del trisagio junto con el cardenal, en la capilla del Rosario donde yacen los restos de Fernando Rielo. 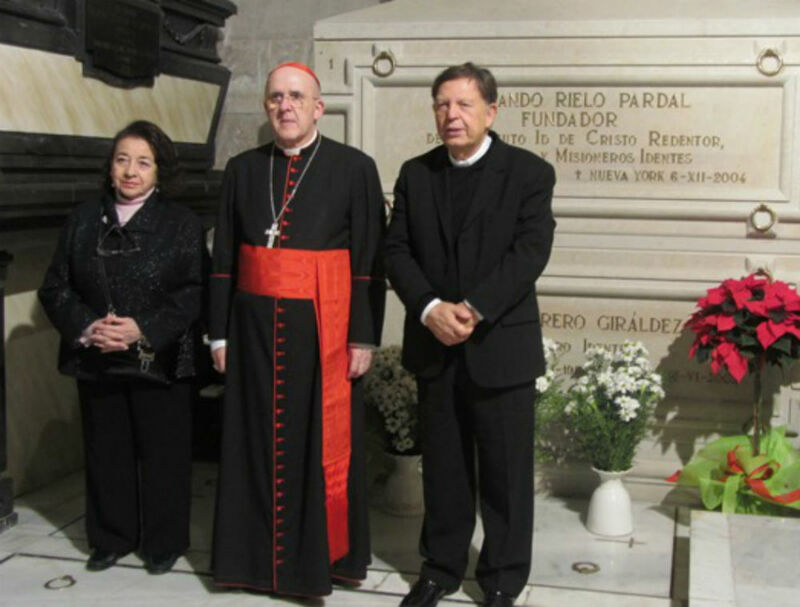 El cardenal, el presidente del Instituto Id y la superiora general de las misioneras identes delante de la tumba de Fernando Rielo. Los superiores del Instituto Id con César Nombela, rector de la UIMP, su esposa y Fernando Saavedra. 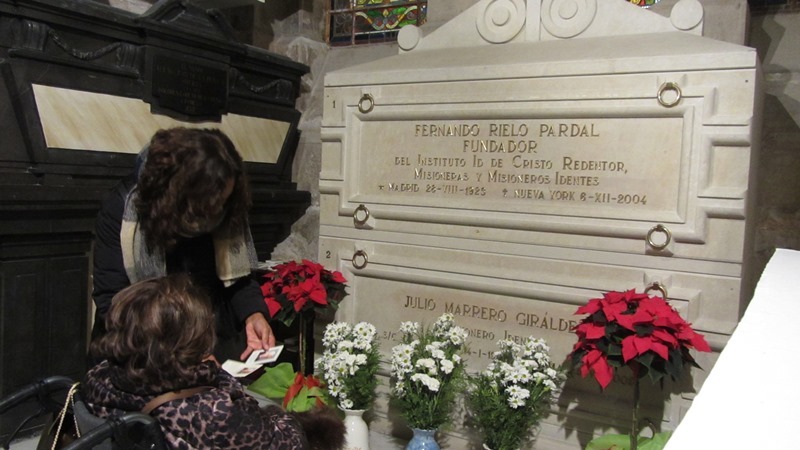 Algunos de los asistentes visitando la tumba de Fernando Rielo. Durante la proyección del documental “Sed santos. 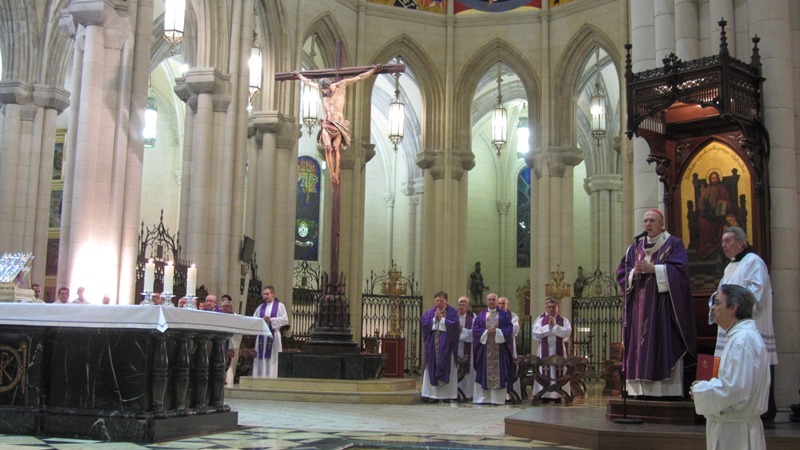 El carisma idente” en el Seminario Conciliar de Madrid. Vista de parte del público asistente a la proyección. Vista de la nave central de la catedral desde el coro. 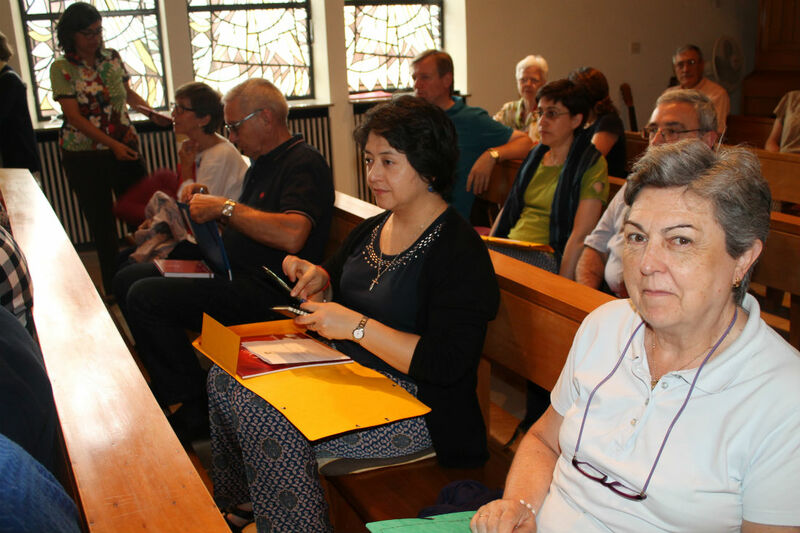 A training course for Idente missionaries from around the world was held in the monastery of St. Benno in Bad Lauterberg (Germany) from 17 to 28 August. This course has gathered more than eighty members of the Id Institute coming from the different missions and countries (19) where the Institute is present. These days of study and formation have been very intense. 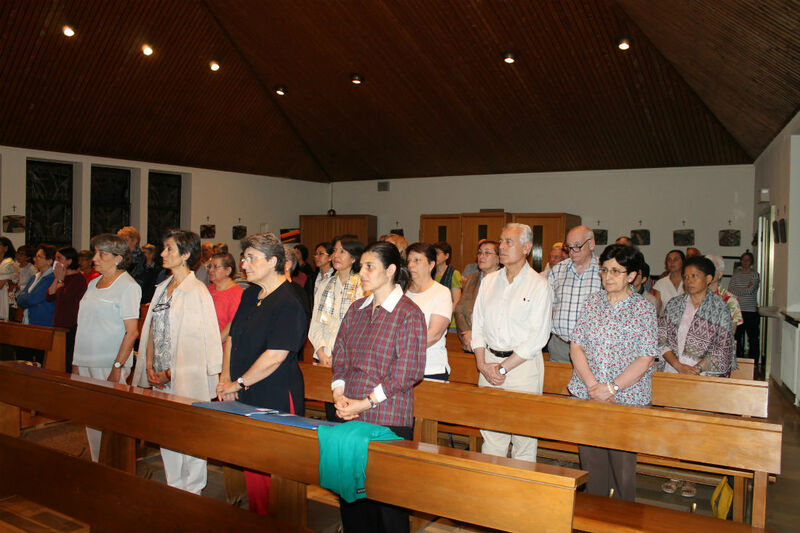 The themes have been, among others, the main lines of the idente charism, the formation of celibate and married members as well as that of priests, the challenges of the apostolate in today’s world, and education in affectivity. The methodology combined lectures with work groups which aimed at a common reflection and analysis on the various themes, and their application in the various contexts. 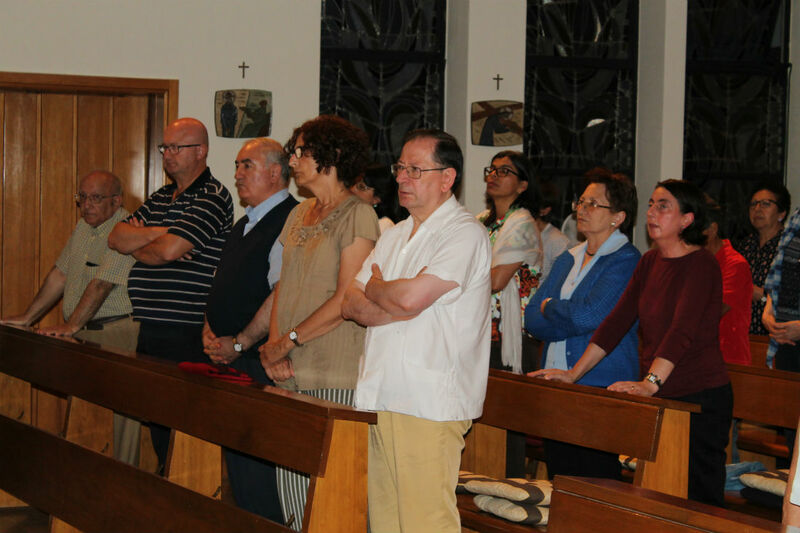 In addition to the study sessions, the course included various moments of personal and community prayer as well as the celebration of the Eucharist, all in an atmosphere of warmth and family spirit, always promoted by the founder, Fernando Rielo. 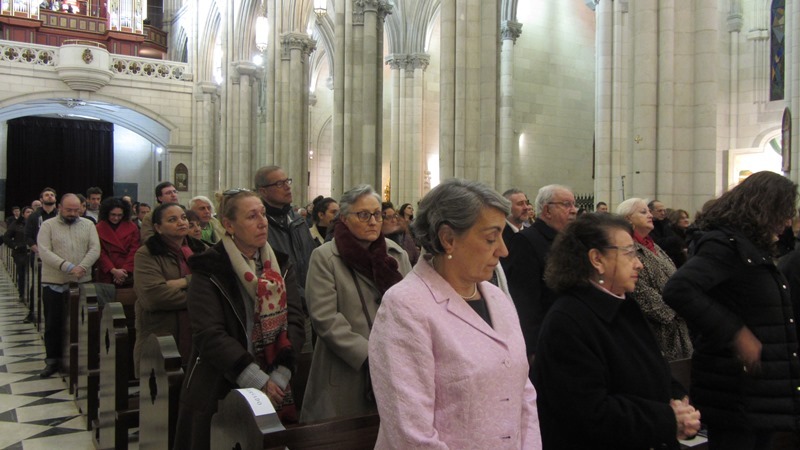 During the inauguration Mass, Fr Jesús Fernández, President of the Id Institute, said that formation means conversion and that the course should be an opportunity for that. 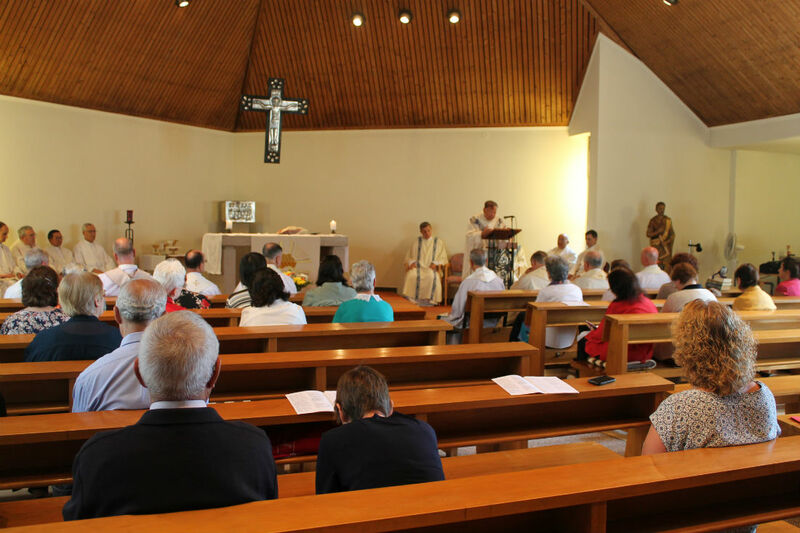 He exhorted everyone to understand conversion as no longer to look at oneself but at the heavenly Father and to live intensely three pillars of spiritual life: continuous prayer, the Eucharist and the Gospel. There has also been a tourist visit to the medieval city of Göttingen, famous for its university and the Max Planck Institutes of Medicine, Chemistry, History and Research of Corrientes. The whole Paschal Mystery of Christ consisted in an itinerary of returning to the Father, from His birth till His death on the cross, His resurrection, and finally, His ascension into heaven. The cross was therefore not the end for Christ, but His return to the Right Hand of the Father, to the fullness of glory. The Resurrection is a sign of life. Christ had said: “I am the Way, the Truth and the Life.” (Jn 14:6) Life does not arise from noise, but from the silence of prayer. Today’s society, with its crises and its signs of death, more than ever needs clear announcements of life and resurrection. Today advertising creates the desire to have: to enjoy, to control, to order others around, to be happy, to earn money, etc. Whoever doesn’t have something doesn’t count. Whoever wants to have and can’t is a failure. This is the message, the advertising. But Christ, with His resurrection, announces another horizon of strength, of struggle, but with peace and serenity. Strength lies in the truth, not in appearances. The message of Christ with His resurrection is a message of a new life of honesty, transparency and responsibility. The resurrection of Christ, conquerer of death, is His great victory: “I have overcome the world.” (Jn 16:33) That is the truth. Lying, the lack of honesty, and injustice have no future. Only love and transparency can go forward toward the future without fear if we let ourselves be permeated by the love of the Father Who never deceives us. The disciples found the risen Christ in the community, recalling His words, “wherever two or more are gathered in My Name, there am I in their midst.” (Mt 18:20) This means that they found Him in prayer, in the Eucharist and in the reading of the Word, always keeping in mind that Christ is the Good Shepherd Who gathers His flock. What happens before the empty tomb? Each one communicates to the other the little or the much that he or she has seen, and together they obtain the light they need to overcome the grave difficulties that are never lacking, or the situations that create confusion and disconcert us. Christ becomes visible when we move and when we communicate, not when we are alone, quiet, concerned about what we think is most important, about what we believe to be our rights and our liberties, stripping and weakening the freedoms of others. When do we perceive that the risen Christ is in our daily life? Each time we resolve our conflicts in the light of the Gospel, when we sincerely live the spirit breathed by each word of the Gospel, and especially when we recognize our human miseries and our sins, when we truly love one another and we forgive one another wholeheartedly. Those who do not love cannot forgive. In love and in forgiveness, which is the most sublime level of love, the risen Christ is found. The sign that Christ has risen is that there are many acts of goodness and holiness in the world. If we live as Christ loved us, our vision of the world would change radically. Twenty centuries have passed, and the crucial thing is to “listen” in the deepest part of our hearts; to listen to the voice of Christ, risen and alive in our hearts, in the Church, in the Institution, in our communities. He is the voice of our Faith and our Hope. The risen Christ is pure sanctifying grace that overcomes, within us, all malice or any unhealthy intention. The risen Christ never abandons us, either in suffering or in death. He really accompanies us in our passing from this valley of tears to the Heavenly Jerusalem. Death is not the end; only life and resurrection have the last word. We must depend on and trust in the Gospel with a strong faith that is like a rock, because this donum fidei (gift of faith) depends on a stronger someone who grants the strength. We are speaking of trusting Christ, of having confidence in Him, because He is our rock and our salvation, as the Scripture tells us (Ps 62:7). With the walls of our pride of spirit, which is the cause of all evils, it is impossible for us to express ourselves to Christ and our neighbor with affection and fondness. We may often believe that we are speaking with Christ, but if we remain behind that wall, we cannot hear or discern His voice, and so our heart remains very far from the experience of His mercy. We need help, and we need to listen to the words of Christ to the Samaritan woman at the well of Sychar: “Give me a drink of water.” (Jn4:7) The entire dialogue begins with the water of our baptism that is transformed into sanctifying grace in our spirit. Is this water stagnant in our heart, so that it issues forth cloudy, allowing us to see in Christ only strong or hard words about important problems in life? And yet, Christ comes to you and to me with tenderness, with affection, with gentleness, with an extraordinary light. When we read and live the Gospel, our cloudy water, filled with dust and mud, begins to move toward the truth and toward the true life who is Christ Himself. It is being changed into living water that wells up to Eternal Life.